Let the moonlight bathe you as you connect to your stillness through a journey of meditation and sound from crystal bowls. Full moons bring energy to set intentions, to bathe in the fullness of your own SELF. Let Arianne Traverso — of Om for All yoga and artistic director of The Yoga Expo — guide you in this journey to release stress and bring energy into your life. New to meditation? 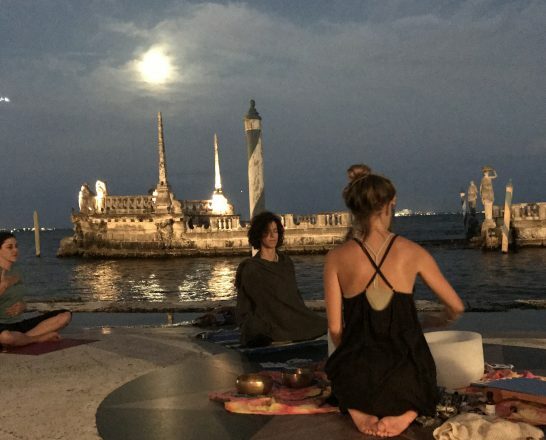 Held at Vizcaya, overlooking Biscayne Bay during the full moon, this meditation session features light yoga and the use of sound bowls to help you relax and develop a deeper awareness and stillness of self. Arianne specializes in meditation as well as gentle and restorative yoga. No yoga experience needed. Bring a cushion, pillow or mat as needed for meditation. Non Members -> Purchase of a $50 adult ticket below includes an Individual Membership to Vizcaya (valid for one full year) as well as one ticket to the member’s only meditation class.